The most frightening sound during battle with the Daqan Lords isn't the clash of blades, the winding of crossbows, nor even the creaking of the Rune Golem's massive limbs. No, it is the growing roar of the relentless hooves of the powerful Oathsworn Cavalry. Enemies of Terrinoth live in fear of these lifelong warriors, sworn to a baron or free city until their dying breath. The fear is well founded, as any lucky survivor of a battle will tell you of the flash of steel crashing through the battlefield, the swords and spears of the riders perfectly in sync with their mounts, cleaving through whatever enemies stood in their way. 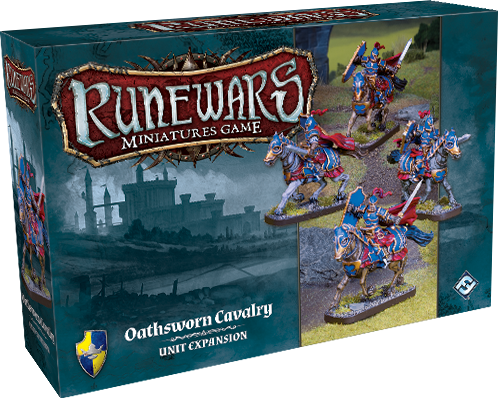 Fantasy Flight Games is proud to announce the Oathsworn Cavalry Unit Expansion for the Runewars Miniatures Game is available now! The Oathsworn Cavalry Unit Expansion features four Oathsworn Cavalry figures, enough to field a two-tray unit or increase the size of another unit, as well as five upgrade cards for use with any army. 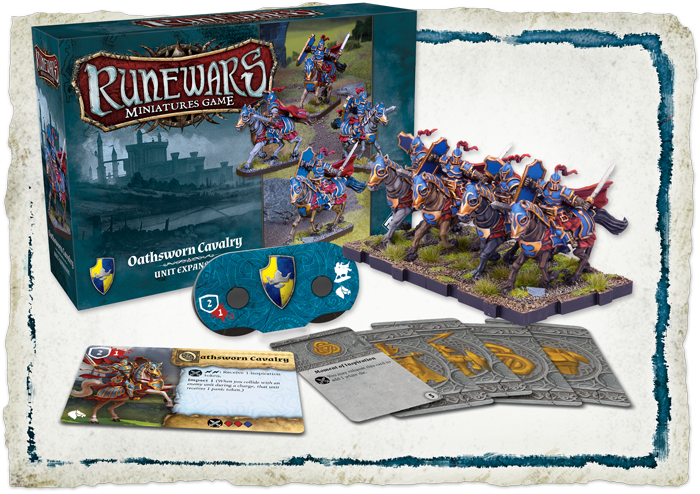 The Oathsworn Cavalry Unit Expansion is one of the quickest ways to expand your army and customization options in the Runewars Miniatures Game. With unparalled speed and brutal melee attacks, the Oathsworn Cavalry can quickly enter a battle and make an impact. 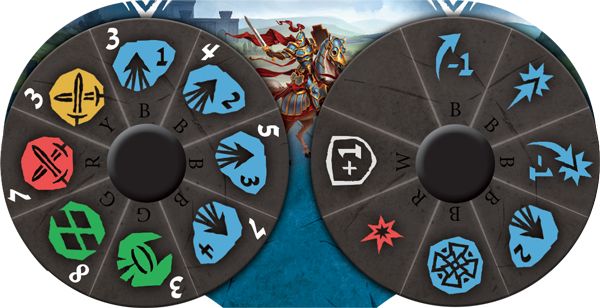 The new figures can be combined with the ones found in the Runewars Miniatures Game Core Set for 34 points or fielded on their own for 20 points. On the defensive, the Oathsworn Cavalry are difficult to take down. Their defensive value of two makes dismounting a rider difficult to achieve, and with a white defensive modifier on their dial, they can become a defensive wall, provided you’re willing to give up other helpful modifiers. The Oathsworn Cavalry's resolve is also difficult to shake, their loyalty never in question. With the ability to spend two surges to get an inspiration token, placing a bane token on the cavalry and having it stick is quite a monumental task. For an in depth look at the full capabilities of the Oathsworn Cavalry, click here. With an army featuring the Oathsworn Cavalry, no enemies will be safe from the blades of the Daqan. Able to chase down any foe with blinding speed, the brave riders are sure to cut a path to victory. Mount your steed and purchase the Oathsworn Cavalry Unit Expansion (RWM03) for Runewars Miniatures Game from your local retailer today!